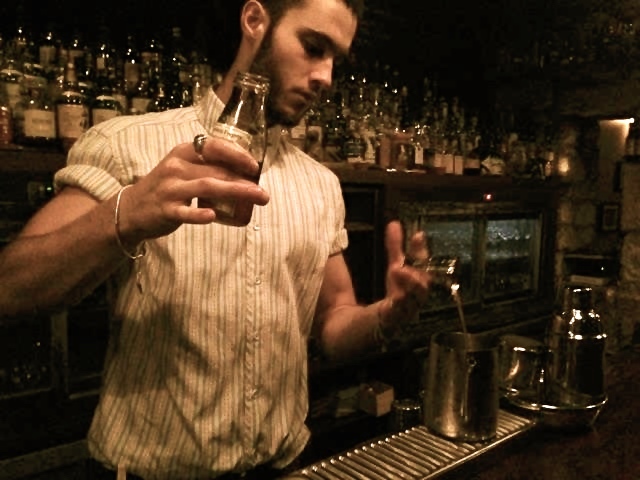 Hi I’m Lucass, and I’m a bartender at Sherrybutt, Paris. I’ve been here for 5 months. Before that I worked in London. At the beginning I used to work in luxurious establishments as waiter or chef and one day in Bordeaux at the gastronomic restaurant “le Chapon fin” I worked with a wine waiter, who was a fan of cognac. He shared his passion with me. From that moment I became a cognac fan too, and made my first step towards bartending. Firstly in a hotel, then to a speakeasy bar where I found what I was looking for, where everything is home made. A lively cocktail bar, in fact I prefer that to a quiet one, which is a paradox because I work in a quiet one most of the time. Cocktails shoud be fun, with loud music and a touch of craziness. As I explained before, I am a cognac fan, because I come from Bordeaux where I grew up whith cognac around me. When I mix it in drinks, I love its complexity, its sweet side and at the same time its power. It’s like a wine too when you use it as a dash. It’s a very complete product to use in a cocktail. A good cocktail is just well balanced. What I want to hightlight is not a spirit, even if it was obvious, but recently we’ve created a shrub of peach and aneth (syrup vinegar based) which produces a touch of rustic and freshness. In Paris Joseph Akhavan at Mabel (opening soon). Fabien at l’Entrée des artistes. In London Satan’s Whiskers, because I am classical in the way I make drinks and they have a menu very classic and simple, old school style. I love to go to Happiness Forgets, for its crazy side and of course Artesian, a real experience to live with Simone Caporale and his team.